I’ve visited the British Airways Concorde Room and Galleries First Lounge in Terminal 5 before. This is a review of the Galleries First Lounge in Terminal 3. Again, there are three oneworld lounges in Terminal 3: British Airways, Cathay Pacific, and American Airlines. 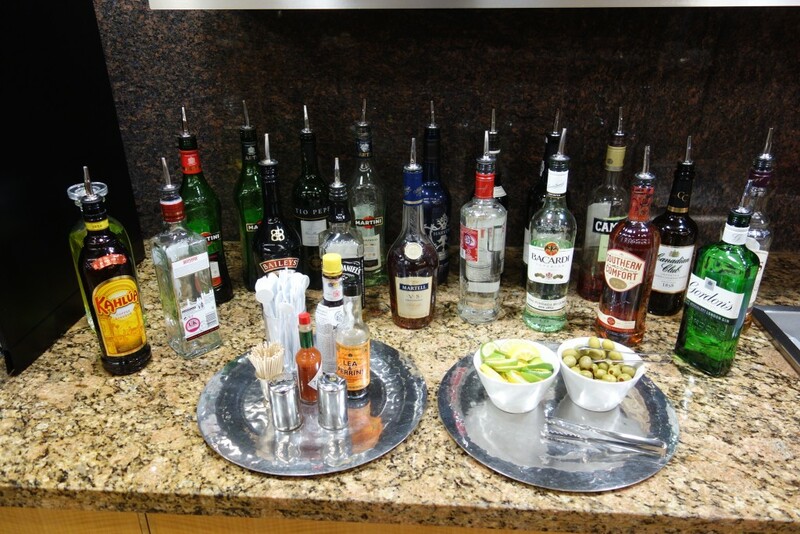 While there’s really no reason to visit the AA lounge, the BA lounge is best if you care about alcohol. I’m not a big drinker myself, but others have told me that this lounge has by far the best selection of liquors. This lounge is also pretty sizable with a number of different seating areas. Make sure to explore before committing to where you sit. There’s also a small dining room at the far end of the lounge. The lounge is an odd combination of self-service and wandering servers who will bring you things. They have menus floating around the lounge, but there’s also a self-service buffet as well as a dining room. I’d probably check out the buffet first to see if that suffices for you and then try asking someone for things off the menu. I don’t think the food options in this lounge are any better than the Cathay lounge. The buffet is a bit larger, and there seems to be more frequent turnover of food, but the selection of items seems more limited to me. In the mornings, it’s a pretty typical English breakfast spread with some more egg dishes on order. Overall, if you want to drink, come to this lounge. Or I guess if you really want kippers or porridge. The lounge is large and can accommodate a lot of people, and it has a designated play area (not pictured here because kids were using it when I visited and I didn’t want to look like a major creeper). On the other hand, the bathrooms are not the cleanest, the food is pretty meh, and the lounge agents seem more interested in watching cricket than serving. This entry was posted in British Airways, Lounge Reviews, Travel, Trip Reports and tagged airport lounge, british airways, lhr, lounge review, travel, trip report on March 16, 2016 by Edward. The lounge isn’t huge, but I’m impressed by it. In the times that I’ve visited, it’s never been very crowded, so that may have contributed to my positive impressions. But there’s plenty of seating, and it just feels calm and serene. The drink options are extensive for such a physically small lounge. The liquor selection might not be as good as the British Airways Galleries First lounge, but I don’t drink much, so that doesn’t matter to me. What does matter to me is that they have fun non-alcoholic drink options like coconut water, mango juice, and soy milk. The food options are also extensive, and it reminds me of a mini Asian hotel buffet. For breakfast, they have English breakfast items (e.g. baked beans, eggs), a noodle bar, smoothies, congee, pastries, oatmeal, yogurt, etc. So lots of options, even though it’s a small space. The rice pudding I had was delicious, and the dan dan noodles were very peanut buttery, which I liked (even if it’s not authentic). As for getting actual work done, there were a decent number of power outlets, and it wasn’t very crowded, so there’s lots of space to spread out. The wifi speed was decent with about 3-4 Mbps down and 1-2 up. Again, this is my favorite oneworld lounge in LHR Terminal 3. Maybe it’s just because I’m Asian, but I think this lounge has the best food options, and it’s not as crowded as the other oneworld lounges, so it’s the most peaceful and pleasant to just sit in. This entry was posted in Cathay Pacific, Lounge Reviews, Travel, Trip Reports and tagged airport lounge, cathay pacific, lhr, lounge review, travel, trip report on March 15, 2016 by Edward.